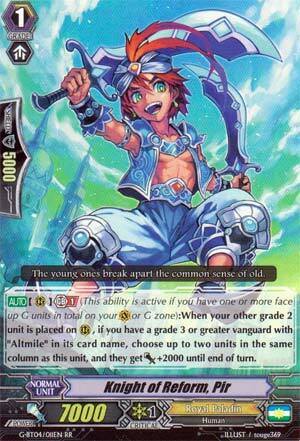 [AUTO](RC) Generation Break 1 (This ability is active if you have one or more face up G units in total on your (VC) or G zone):When your other grade 2 unit is placed on (RC), if you have a grade 3 or greater vanguard with "Altmile" in its card name, choose up to two units in the same column as this unit, and they get [Power]+2000 until end of turn. Yes, I know there's plenty more Touken Ranbu to review but since Nanya and I weren't looking forward to it (and because I want him to suffer choosing them instead) we're doing the under-appreciated BT04 cards, before Vanguard and Deletor hits us. Starting us of is Knight of Reform, Pir. As his GB1 skill, when a Grade 2 unit is called, Pir and whoever's in the same column as Pir both gain 2k power. Basically, this guy is your main source of column forming in Altmile.dek and by extension Sanctuary Guard.dek too. Chaining cards such as Benizel and Knight of Twin Sword to call several Grade 2s for big numbers. Sadly, being a Grade 1 there's no quick or cheap way to search him if it's the Sanctuary Guard variant you're using but if run at 4 you should have a decent chance of drawing at least 1 at least. Also note that the column needs to be 17k+ for the effects to start being noticeable right off the bat: if it's 16k then Pir needs to spring twice to force another 5k guard out of the opponent, but Knight of Fragment and Benizel on the turn he appears can cover that, anyway. G Royals can't really function without this. Get him if that's what you intend to take Royals down.